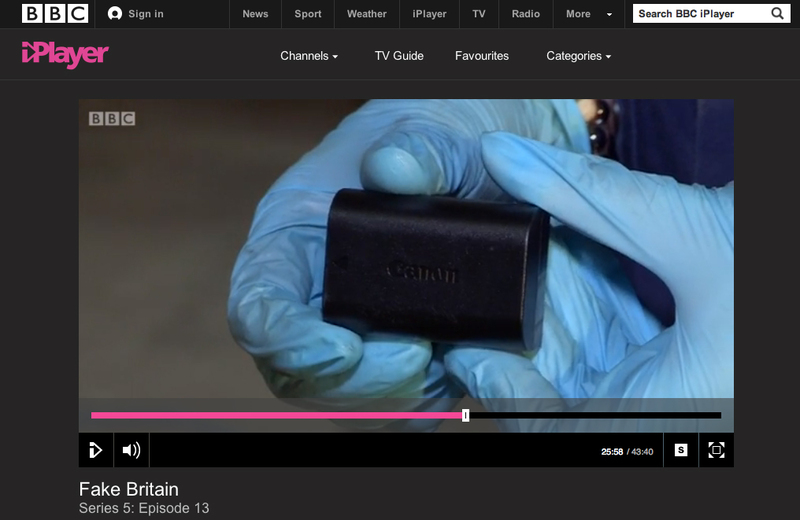 The dangers of fake camera batteries are highlighted in a BBC programme that shows a raid on a property containing thousands of suspected counterfeits. Fake Britain highlighted the recovery of bogus Canon, Olympus and Sony Cyber-shot batteries, which led to a man’s arrest. Wally Dinn, from North West Trading Standards Unit, said his team discovered six large boxes of suspected fake camera batteries, thought to be worth thousands of pounds. Dinn explained that fakes were stored inside generic packaging for ‘digital camera chargers’. Earlier this year, the Civil Aviation Authority (CAA) moved to raise awareness of the potential risks of air passengers buying poor quality batteries online, as the number of electronic devices carried on planes rises. The CAA urged passengers to carry spare batteries only in carry-on luggage and to pack them in a separate bag ‘isolated from anything else’. The Fake Britain programme is currently available to view on BBC iPlayer.